Comments: Pound for pound American badgers are likely the most powerful mammals in Kansas. They have stout, flattened bodies, powerful forelegs with large, re-curved claws, strong jaw muscles, short ears and a short, furry tail. If threatened, they attack explosively with hissing, growling and biting. They inhabit open country and are frequently found with colonial rodents, especially prairie dogs. They dig their dens in hillsides and road embankments leaving a conspicuous dirt mound at the entrance. Except during the mating season, badgers are solitary. Females bear a litter of 1-5 young in late spring. Badgers can live 12-14 years but few make it past 2 years in the wild. Distribution: American badgers are found from southern Mexico through the western two-thirds of the United States into southwest Canada. 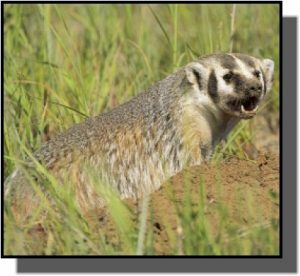 Food: American badgers feed on pocket gophers, prairie dogs, ground squirrels, mice, rabbits, and insects.